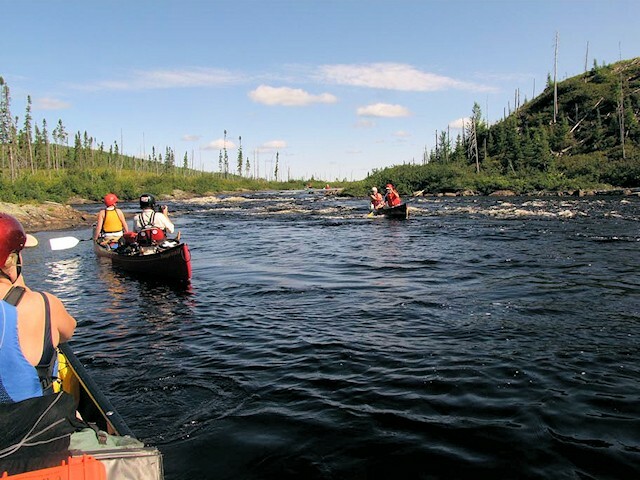 The Mistassibi is a northern Quebec Classic offering great northern Canadian Shield and boreal forest scenery and paddling. The river contains numerous runable rapids and almost constant strong current. 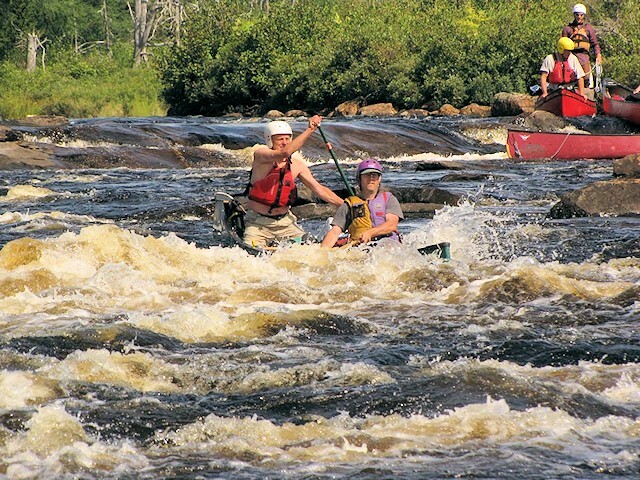 The nature of the river is such though, that it is appropriate for paddlers who are new to whitewater. Our trip will spend 8 days descending the stunning upper stretches of the west branch of the river. Along this 120km section we will encounter almost 80 rapids, concentrated in the 2nd half of the trip. Most of these are in the class 1 to class 2 range, with the occasional class 3. There are 2 short sections that must be carried or lined, all other rapids can be run. Beautiful waterfall all along the route cascade into the river valley from the hills above. We’ve planned 8 days, a relaxed pace to allow time for fishing, swimming, whitewater practice or simply relaxing. The sometimes deep upper river valley is forested primarily with stunted black spruce, as we travel south the forest becomes more varied. On many trips we expect to encounter virtually no other paddlers. Fishing is excellent along the route. Paddling and camping Skill level required is intermediate, but no previous whitewater is required, simply previous canoeing experience . 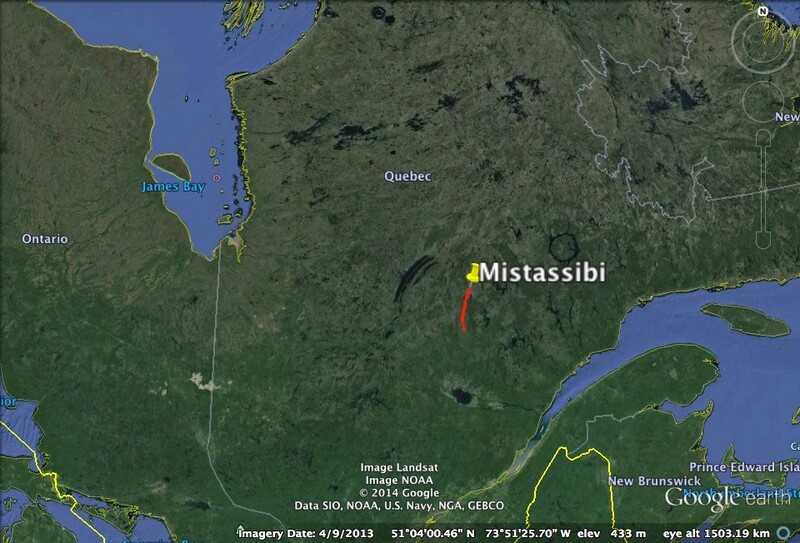 The group will meet in the village of Mistassini on the evening before the trip. This enables an early start for our morning shuttle the next day. 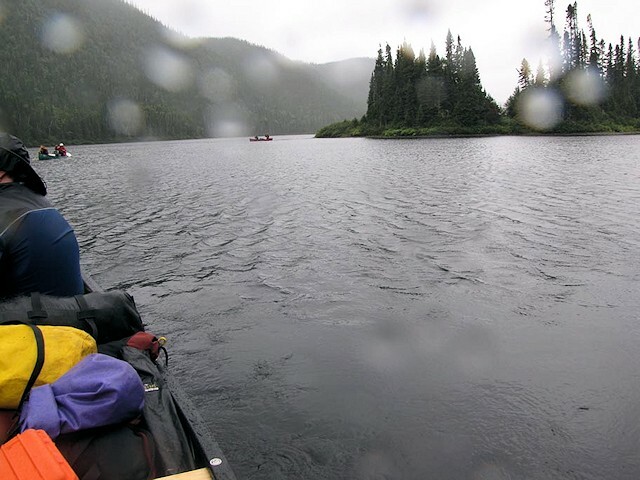 We will drive several hours north on logging roads to near the headwaters of the Mistassibi river. We hope to be at the put in by approximately lunch time. Once on the river we’ll review whitewater paddling before proceeding down river. We’ll make this first paddling day a short one to allow everyone to ease their paddling muscles back into shape. Our first campsite will be downriver through swift current for about 7km. It is 33km from the first campsite down through fast flowing water and scenic hills to Lac Au Foin. 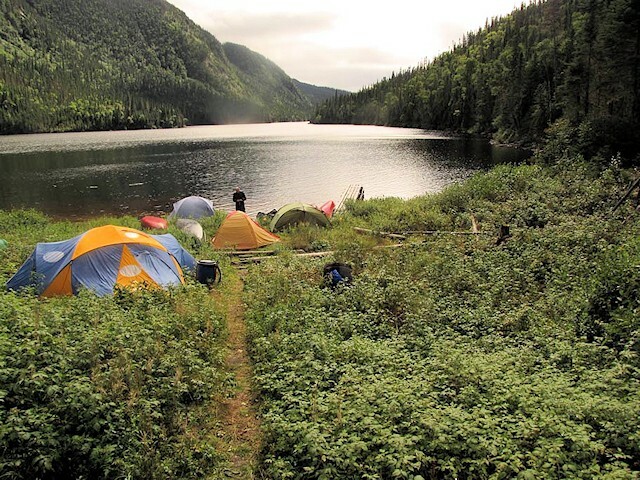 Camp on nite 3 will be made somewhere near the beginning of this stunningly beautiful lake. Lac Au Foin, really a slight widening in the river between towering hills, runs for 20km. It will take us about a day to paddle the Lake. The scenery is impressive. The character of the River changes below Lac Au Foin. 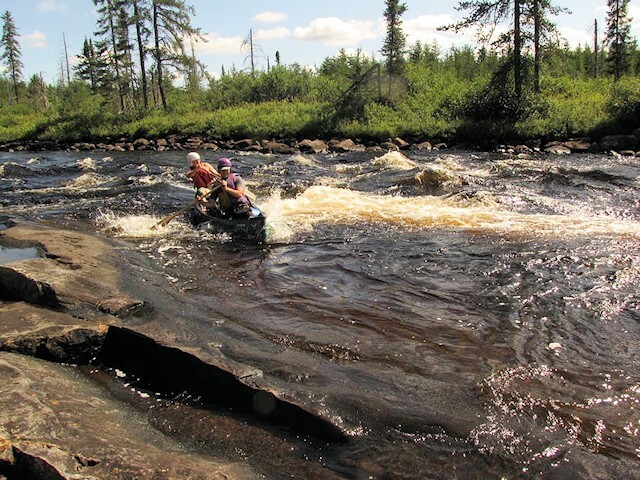 The upper river is scenic and fast flowing but with few true rapids. Below the lake there are numerous class 1 & 2 rapids and fast flowing current all the way. 98% of the rapids are easily runnable. There are 2 short R4 rapids that need to be lifted around or lined and there is one R3 that will be scouted carefully before running. (lining or portaging are also possible here). 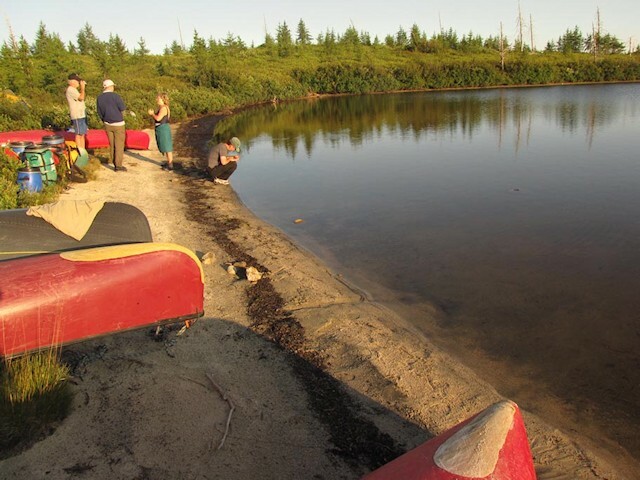 On the last day we will paddle about 16km to the take out point where our vehicles will have been left. The final day, like the proceeding few will contain a number of swifts and class 1 and class 2 rapids. From the take out it is several hours back to Mistassini-Dolbeau where we will arrive by late afternoon. * Please note: It’s the nature of remote northern travel that uncontrollable factors like poor weather, pilot judgment, forest fires, and mechanical problems can affect our schedules and cause delays. We regret these situations but cannot accept responsibility for hotels, flight rebookings, and other costs you may incur. We will meet in the town of Dolbeau-Mistassini the afternoon/evening before the trip starts. There are a couple of motels or it is possible to camp in the area. We suggest that people meet at the Hotel Chute des Peres (our guides will be staying there). Folks will may well want to book in here for the night after the trip as well.